What should I call my first blog entry? I like teaching about science and technology through history’s lens. This approach provides many opportunities to teach across disciplines; history and geography lessons are easily incorporated when instruction, discussion or activities are built around great scientists, inventors and explorers. I’ve found, for example, that it’s nearly impossible to teach the fifth grade Forces and Motion unit labs without introducing Newton and his laws of motion. Where and when did he live? Were there other scientists or inventors working to solve similar problems or answer the same questions at the same time? Where did they live? Sometimes, this instructional strategy can foster student insight into larger lessons about politics, philosophy and human nature. One effective related tactic is having students imagine life before particular technologies were developed. As a former avid photographer and darkroom enthusiast in the days of film, I have one lesson where I walk students through the picture taking process back in the day, from purchasing and loading film to taking “un-previewable” pictures and dropping film for development and pick up, and paying for processed prints. It’s a story that is fairly easy to tell with great drama when comparing it to the recent convenience of capturing and transferring digital images. This past Christmas, my sister worked with my father to archive a significant portion of his vast 35mm slide collection onto DVDs. My father was in the Army in the mid to late 1950’s and acquired a Voigtlander rangefinder camera, with a sharp Zeiss lense, at the base PX. He was stationed for a while in Europe, and was able to travel rather extensively through western Europe and across to England and Scotland. 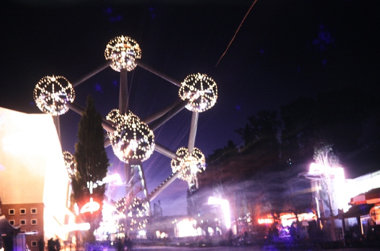 In 1958, he was fortunate to be able to visit the World’s Fair in Brussels. American Pavilion at Brussels’ World Fair (1958). 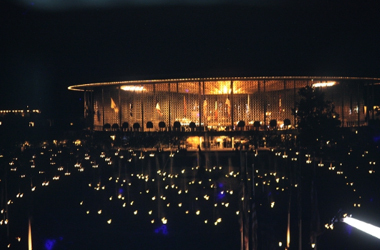 There are a variety of types of World’s Fair Expos, and Brussels had hosted these events on a couple of prior occasions. 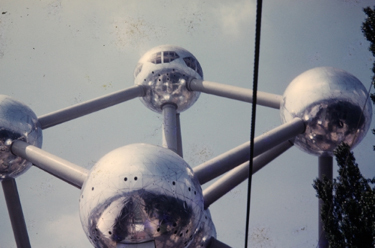 Of course, there are often permanent structures associated with various World’s Fairs throughout modern history (Eiffel Tower, Seattle’s Space Needle & New York’s Unisphere), and the 1958 Brussels’ Expo featured the iconic Atomium. This year will be the sixtieth anniversary of that event. When I asked him about memories, one thing that my dad mentioned was that the Soviet Union’s pavilion had the longest lines. In the fall of 1957, the Soviets had successfully launched the Sputnik program, with satellites that orbited the earth for weeks before burning up on re-entry. 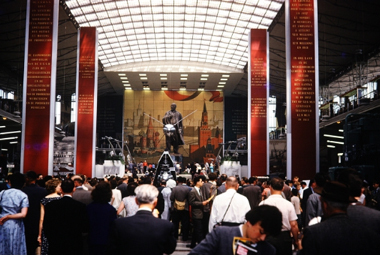 Their pavilion had a model of Sputnik 1 under the watchful gaze of a statue of Lenin. That event and its associated technology is generally referred to as the official start of the space age, and, as the US and Soviets were locked in a cold war surrounding the development of their respective nuclear arsenals, it certainly signaled the launch of what became known as the space race. These two rival empires, who could barely maintain peace, aggressively competed to develop technologies to conquer the problems of space travel. Every milestone both represented and fueled the cold war. And, by any standard of measure, the Soviets led the space race for exactly one decade. In December of 1968, the US leapt ahead in this 20th century showdown, when NASA sent Apollo 8 to orbit the moon with three astronauts aboard. The USSR had an unmanned landing and an unmanned orbiter, but America restructured its Moon exploration program and hurriedly sent Jim Lovell, Frank Borman and Bill Anders to circumnavigate our nearest celestial neighbor from an average distance of about 60 miles above the surface (after a nearly quarter million mile journey) for a total of 10 orbits before firing rockets for the return trip. They scoped out potential landing sites for future missions and took the now famous “unscheduled” picture called Earthrise, the first photograph ever of the entire planet Earth viewed from space. If history reflects an American victory in the Cold War (and it’s probably safe to say that that is the consensus among scholars), this was the first victorious battle. The world will celebrate the 50th anniversary of that event, an event I’m old enough to remember, this December. The generation of students that I teach, while they’ve not had huge and far reaching successes with their space program, should be proud that they are part of the first generation that has never not had people in space. Indeed, the International Space Station, designed by a multi-country consortium that includes the US and Russia and manned since 2000, provides perhaps the most hopeful symbol ever of what countries can accomplish when they can focus on common goals instead of differences. I’ve had an interesting day today. Solidly ten miles of construction related stop and roll traffic on I-40 and getting lost multiple times for maybe an hour and a half or so after getting off of 40 behind a sorry set of directions from Google Maps to NCCAT (for my money, Mapquest remains the superior online directions assistant) yielded one extremely late, hot, tired and frustrated Kenan Fellow. But when I arrived, circumstances began to improve immediately, as is always the case when you know you’re involved in something good. The NCCAT staff were welcoming and helpful. Kenan Fellows staff were reassuring regarding my tardiness. It was easy to fall into the sessions and figure out what was happening and how to fill in the parts I’d missed. Oh yeah, and teachers. My people! Being surrounded by folk who, day in and day out, during every working moment, must demonstrate unending patience for the late, the hot, the tired and the frustrated was exactly what this flustered Fellow needed just then. Now look at me. On top of everything, I’m blogging! Per a late email request to the faculty at my school (Fuller Elementary in Raleigh), I’ve been receiving responses to help me create the list of words to describe the most well known features of my personality. Not a single colleague listed “luddite” to describe me, but they all know it applies. Information technology and I have a hate/hate relationship, and I somewhat resigned to be a carburetor guy in a fuel injected age. Nevertheless, thanks to the good folk who work hard to make the Kenan Fellows program happen, I have a blog! I can’t wait to post cool stuff from, not only my awesome internship but all things related to my fellowship, as well as stuff from the Elementary Science Education realm. Posted on June 18, 2018 Leave a comment on What should I call my first blog entry?